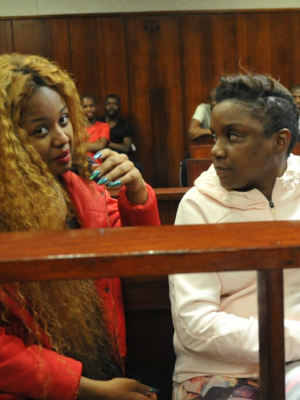 Babes Wodumo and her sister, Nondumiso Simelane have been found guilty of contempt of court at Durban Magistrate Court on Monday afternoon. The starlet has been in the news for unpleasant news lately but the most shocking being her pending arrest after she, her manager, Nondumiso Simelane and Thobeka Ndaba – also known as Tipcee, allegedly assaulted a woman believed to be Babes’ friend. It is alleged that the trio, attacked the woman at a guest house in March. The common assault case against the trio was opened at the Umbilo police station, Durban and they were set to make their first appearance in Court A, at the Durban Magistrate Court. But Babes was nowhere to be found on the court date, leaving the court with no option but to issue an arrest warrant for the muso and her two alleged accomplices. Babes’ defence lawyer Advocate BS Khuzwayo argued that Babes Wodumo's car broke down which is why she could not make it to court on the date that was set but the magistrate did not accept this as a valid excuse. Tipcee issued a medical certificate for her absence, which was accepted by the magistrate. Babe's defence tried to argue that Babes earns R15 000 a month, that she is the breadwinner in her home, and asked the magistrate to be lenient on her. Later the magistrate ruled that the trio will either spend 30 days in jail or have to pay a R1000 fine. They will also remain in custody until they pay the fine.